Transporting and handling corrosive gases at high temperatures is ubiquitous in industrial chemical processing and power generation, but corrodes conventional metal alloys. Austenitic steel, a stainless steel alloy commonly used in harsh environments, forms a chromia (Cr2O3)-scale oxide layer to help protect alloys from corrosion. However, the chromia protective layer can deteriorate. This significantly reduces component lifetime, as well as the energy efficiency of processes that use this metal’s products. Although chromium (Cr) metal is critically important to the energy efficiency of the U.S. industrial infrastructure, it is not available domestically. Therefore, the development of a cost-effective alternative to chromia-forming alloys that uses lower amounts of Cr is of high importance. An alternative to chromia-forming alloys are those that form alumina (Al2O3) as their protective layer. Alumina-forming alloys exhibit superior high-temperature corrosion resistance, due to slower oxide scale-growth rate and greater thermodynamic stability at high temperatures (900-1200oC). Numerous attempts to produce Fe-base alumina-forming casting alloys on a commercial scale with the high-temperature strength needed for structural use have failed. Prior to this project, ORNL patented several, new Fe-base austenitic alloy compositions with excellent “creep” (sagging under structural loads at high temperatures) resistance and alumina-forming capability at temperatures of 900-1100ºC. However, in order to make this technology industrially relevant, alloy development must scale using new methods that can operate in a large commercial foundry. This project aims to translate the laboratory development of Oak Ridge National Laboratory’s (ORNL) patented alumina-forming austenitic casting alloys into industry-applicable materials that can survive production practices and still operate in high temperatures and caustic environments. ORNL devised the new alloys under tightly controlled mixing, heating, and quenching conditions. However, these conditions are cost prohibitive if scaled up and must be reengineered. The ORNL team has tested over 60 formulations of its alloys, and has down-selected the optimized versions for ton-scale production. ORNL is working with its partners to produce these alloys and processing technologies necessary to use them industrially. ORNL is developing unique formulations that utilize the minimum amount of aluminum for scale formation in the alloy. The alloy is then stabilized with additions of niobium, titanium, zirconium, and other elements to achieve the best properties in industrial use. The team is fabricating and testing a prototype industrial component from one alumina-forming alloy with tenfold oxidation resistance and twice the resistance to creep compared to chromia-forming alloys, with functionality in excess of 1100ºC. The goal is for these alloys to be produced at scale for the same cost, last up to ten times longer, and maintain the same creep life as austenitic steels. 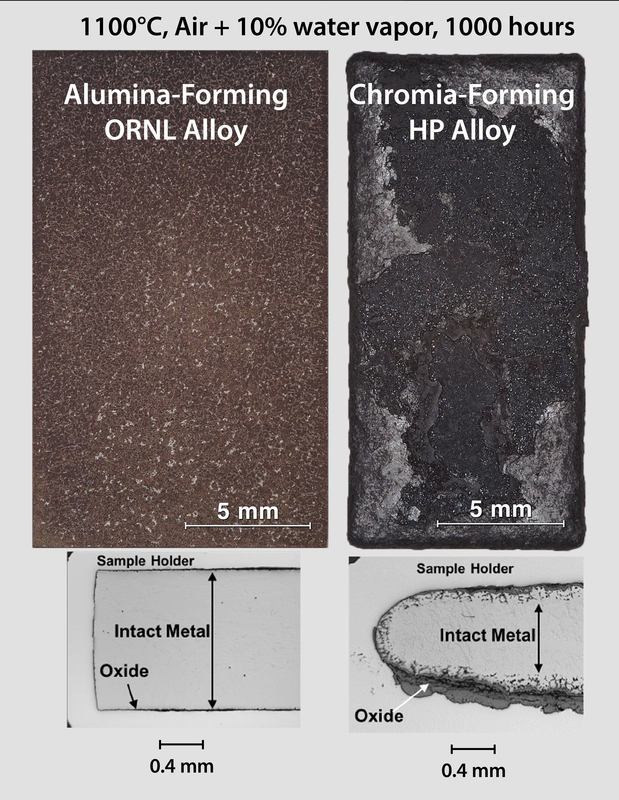 Figure 1: The new alloy developed by the ORNL team is up to 10x longer lasting than the industry standard alloy used for ethylene cracking furnaces. This project united the material developer, ORNL, materials producers and component manufacturers, Duraloy Technologies and MetalTek International, and a potential end-user, ArcelorMittal. 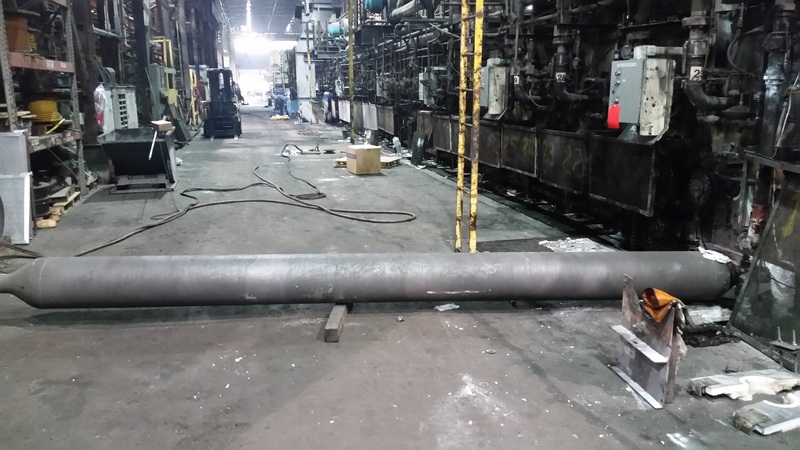 The team identified furnace rolls for steel production as the first application. Furnace rolls are rotating pieces of a conveyor that move steel plates through an austenitizing furnace. These rolls experience drastic changes in temperature and constant stresses, requiring regular replacement. ArcelorMittal successfully tested a prototype roll in April 2017. The trial roll showed no appreciable degradation after 4,000 hours at 900ºC. Under similar conditions, current commercially available rolls corrode, forming oxide layers. The periodic maintenance to remove the oxide results in furnace downtime, loss of production, and roll replacement. Figure 2: Furnace roll made with the ORNL team’s alloy. This roll appears pristine after being in a plate austenitizing furnace at 900°C for 4000 hours. Compared to state-of-the-art alloy furnace rolls, the new rolls result in significantly lowermaintenance costs and improved productivity. The high temperature, corrosion-resistant alloy developed in this project will increase the efficiency and longevity of equipment used in fossil fuel extraction, chemical processing, and transportation fuel production. The potential cost and energy savings are significant given the wide range of applications. The commercial availability of this alloy will enable disruptive improvements in energy efficiency for critical U.S. industrial processes by increasing productivity, reducing costs, increasing equipment life, and decreasing process downtime. The ORNL team has published the scientific underpinnings of this technology twice in open literature. 1 Muralidharan 2013: G. Muralidharan, Y. Yamamoto, and M.P. Brady, US Patent 8,431,072 “Cast Alumina Forming Austenitic Stainless Steels” (April 30, 2013. ); Yamamoto 2014: Y. Yamamoto, G. Muralidharan, and M.P. Brady, US Patent 8,815,146 “Alumina Forming Iron Base Superalloy” (Aug 26, 2014).